The 28th annual Seoul Music Awards took place in South Korea Tuesday night and, as always, it was a real who’s who in contemporary K-Pop with a few actors thrown in for good measure. The looks were delightfully coordinated and mostly monotone, ranging from full-on prom wear to Oscar wear, from funeral wear to casual fashion, a statement in itself. We’ll begin with the biggest boy band—scratch that, band—on the planet, BTS (pictured above). (Listen to “DNA” immediately if you have not.) 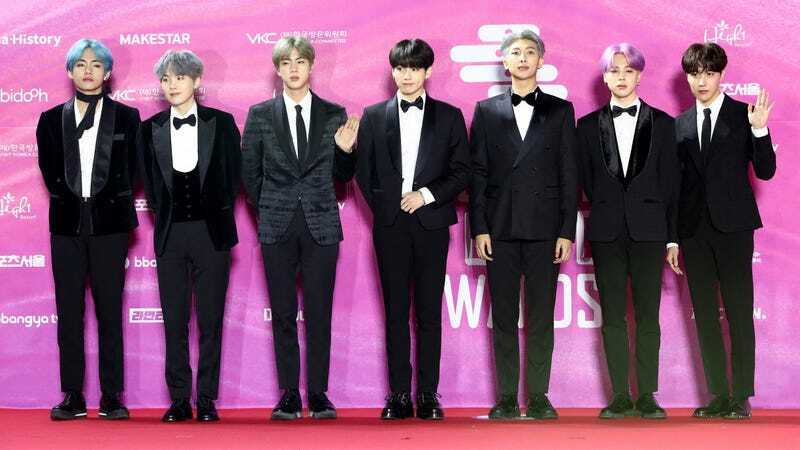 The boys wore black tuxes of varying fabrics, a confident move from a confident group of guys who knew they’d win the the Daesang, the biggest award of the night. Also: Jimin’s hair is lilac now, and it really pops with that black velvet lapel. The sextet K-Pop girl group GFriend opted for matching, textured black dresses and high hemlines. If their name gives you ’90s or ’00s teen pop flashbacks, you’re right on the money with their sound: 2016's “Rough” is an early Britney Spears ballad, and not only because of the schoolgirl uniforms in the vid. Sensing a pattern? It looks like Red Velvet almost arrived in uniform looks but switched it up last minute. I love the playful Victorian ghost dress on leader Irene (Bae Joo-hyun). Their music, like many of the groups you’ll see on this list, varies between bright pop (“Red Flavor”) and nostalgic R&B (“Really Bad Boy”). TWICE are relatively new in the K-Pop game—they formed in 2015, and put out their first full-length in 2017, their second in 2018—which, at the risk of brazen generalization, may speak to their individualized looks on the carpet. Reds, blacks, blues, sheers, sweetheart necklines, Peter Pan collars, wrap dresses, off-the-shoulder looks, there’s a lot happening here, much like their high-energy, hyperactive pop. Taking a conceptual theme to the next level, IZ*ONE, the 12-member girl group (fun fact: “IZ” refers to 12, “ONE” their identity as one tight-nit group) wore wedding dresses to the Seoul Music Awards. I can’t tell if they were going for a sister wives look, or if they want to send the message that they’re married to the music. Either way, I’m inspired. Stray Kids’s navy-gray fits were my favorite of the night. They mastered a coordinated boy band look while tipping their hats to individual member’s personalities with a preppy sweater here, a studded collar there. It’s a very early One Direction move, which makes sense—their music closely resembles modern, Western boy bands. For the retro-pop group Mamamoo, less is more. The group’s ensembles look like slight variations of the same garment, like the episode of the Simpsons when Marge doctors a single Chanel suit and turns it into three distinct looks. This might be unembellished attire, but they appear psychically connected, and that’s the point. Not to be confused with Mamamoo, MOMOLAND’s music, similar to TWICE, is a combination of super skittish, video game pop and spirited, unexpected drops. I only wish their looks here reflected that. Velour is fine, but this lacks cohesion. If I can recreate whole looks at Forever 21, it should be back to the drawing board. NCT 127, a favorite boy band of mine and an octet unafraid of rocking matching suits (their identical tuxes at the 2018 American Music Awards were adorable) should share tips with MOMOLAND. This is how you match your velvets. Their music is heavily hip-hop, which could be considered a rarity in the K-Pop arena. It’s most common to have one member designated the “rapper” title, but all of the guys in NCT 127 can spit. Perfection is iKon’s group look, but mostly for the members with the foresight to pair a turtle neck with their suits. Their single “Love Scenario” took home the award for best song and to me, it sounds exactly like Kesha and Pitbull’s “Timber.” Take that for what you will. SEVENTEEN, a K-Pop boy band with 13 members, appeared to have arrived modeling the latest menswear collection from Banana Republic. I don’t hate it, but those earth tones feel a little unimaginative. That’s a bummer if only because their hip-hop-pop isn’t, and neither is their choreography. They might be the best dancers of the bunch. And now for a few actors: Kang Han-na’s classical, conservative, Hollywood glam gown is most accurately described as twee Morticia Addams. Much like attendees at the Academy Awards often accidentally cosplay like the literal Oscar trophy, Han-na is also totally embodying the prize. K-drama superstar Clara (Lee Sung-min), a perfect angel descended from heaven, arrived on the Seoul Music Awards red carpet to remind us of our disgusting, earthly sins. Good thing this blog is over now, I must repent... and purchase a cape.